We’ve been planning on and excited to make Chloe’s baby food since before she was even born. We saved some veggies from our garden to make her first foods – carrots, green beans and squash. It was organic – because we use a “plant it and forget it” method with our garden. We made it and froze it before she even started eating cereal. Once she started eating other foods, it was easy to just pull out a cube or two and we were set. 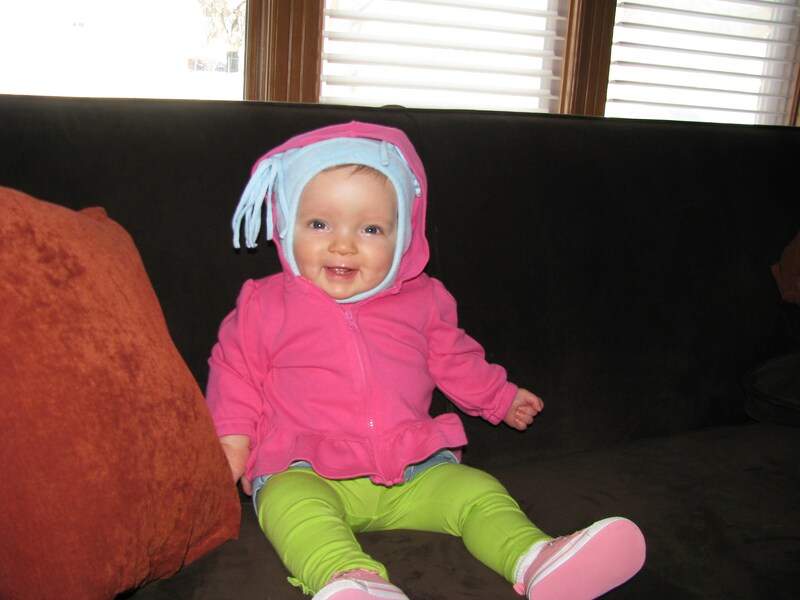 Then Chloe Mae started eating 3 cubes at a time and twice a day, then three times a day…. We quickly ran out of food. 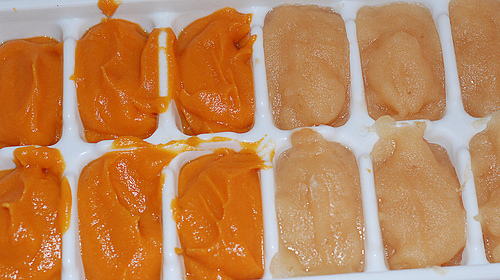 We had a marathon food making session that started one Saturday morning while Chloe was at my mom’s and lasted most of the weekend (one main problem was that we have a limited availability of ice cube trays to freeze her baby sized portions in). That food lasted us just a couple weeks before we were needing to make more. In addition to her pureed food, we were trying to figure out finger foods we could make up ahead of time, because somebody is too independent to eat off a spoon without a fight. So while we still made her food, it was feeling like more of a strain. We weren’t going to stop though, because this was the choice we’d made for both financial reasons (seriously, it’s probably 1/5 of the cost to make our own versus buying store bought) and in the hopes that we were starting our daughter out down the right path with a healthy, free of additives and preservatives, diet. In comes my love of bananas and apple/pear sauce. Bananas are by far the easiest. Buy a few bananas, forget about them for a while, then mash up and feed. Applesauce and pearsauce aren’t a whole lot more difficult. We just peel the fruit, core it and cut into chunks. Then put it in the crock pot, forget about it for 4-5 hours, then throw in the blender or food processor. It’s pure fruit, pretty easy and very delicious!! Being sick for the last few weeks and in the hospital this week kinda made us take a step back on a few things. We’re struggling with getting her to drink her fluids, so we’ve added an overnight feeding back in just weeks after weaning her off. After not eating solids for a week, we’re fighting her on that more than before. I’ve gotten our Maya Wrap back out and am trying to master wearing her on my hip so she can be with me at all times, because she has become very clingy this week. We’re not sure if it’s just because of the trauma of her hospital stay or because of separation anxiety that often emerges at this age, but we can’t even set her on the floor of the kitchen while we empty the dishwasher anymore – she needs to be held!! Despite our recent struggles, we’re loving this age!! She has such a genuine smile and we’ve heard real giggles a few times during tickle sessions. We have real conversations, even though no one knows what we’re saying. It’s almost fun to leave her at daycare in the morning, just to see her adorable wave on the way out, but it’s even better to go pick her up. At the sound of our voices, she turns, shoots us a huge grin and waves excitedly until we pick her up. 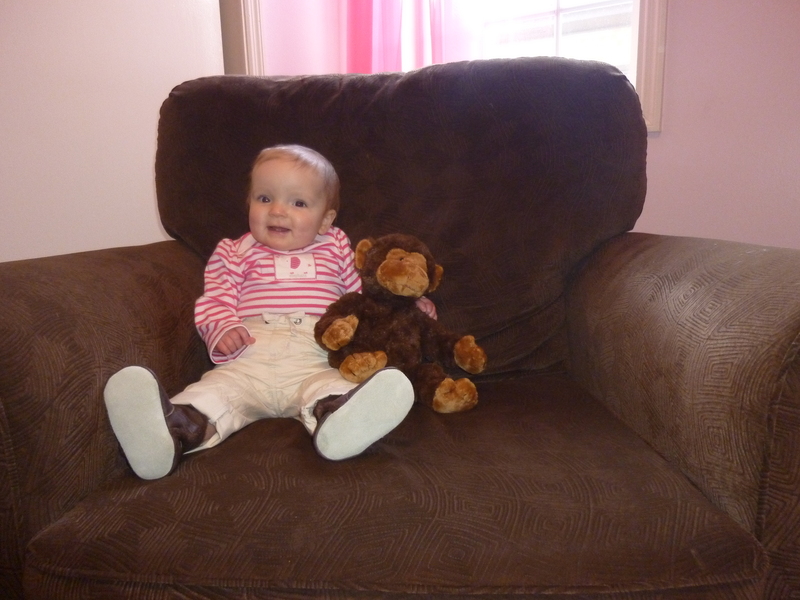 Here she is, our adorable 9 month old (barely a) baby girl!! Chloe has been sick for all of February and then some. We were at a friend’s house late on the last Saturday of January and when we loaded our sleeping baby into our cold car, she wasn’t a happy camper and started crying. It was this horrible screechy cry that turned into a sort of barking cough. The next morning she woke up congested and cranky. She spent the week dealing with her cold and by Friday night she was not happy no matter what we did. We put her to bed early, but she got us up often. The next morning, she was still unhappy no matter what we did for her, so we took her in to Urgent Care. She had another double ear infection. We were hopeful that after a couple days of amoxycillin she’d be feeling better. Not so fast…. She just seemed to feel crummier as the week went on. Her cough got worse and she just wasn’t a happy camper. Friday morning she woke up with a wheeze, so I took her in to the doctor again. 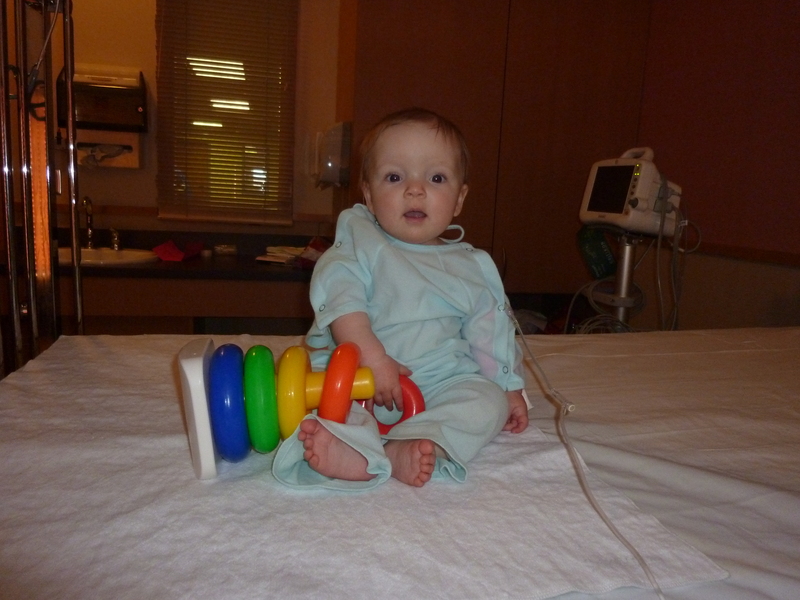 She was diagnosed with Bronchiolitis and we were sent home with a nebulizer to give her albuterol treatments. She screamed through her entire first treatment, and put up a bit of a fight for her second treatment, but by the third she just hung out and cuddled while we gave her the treatment. Again, we thought she’d be feeling better in no time. But Sunday morning our poor little girl woke up feeling just miserable. We usually cuddle first thing in the morning while she wakes up, and instead of waking up, she fell back asleep on my chest. 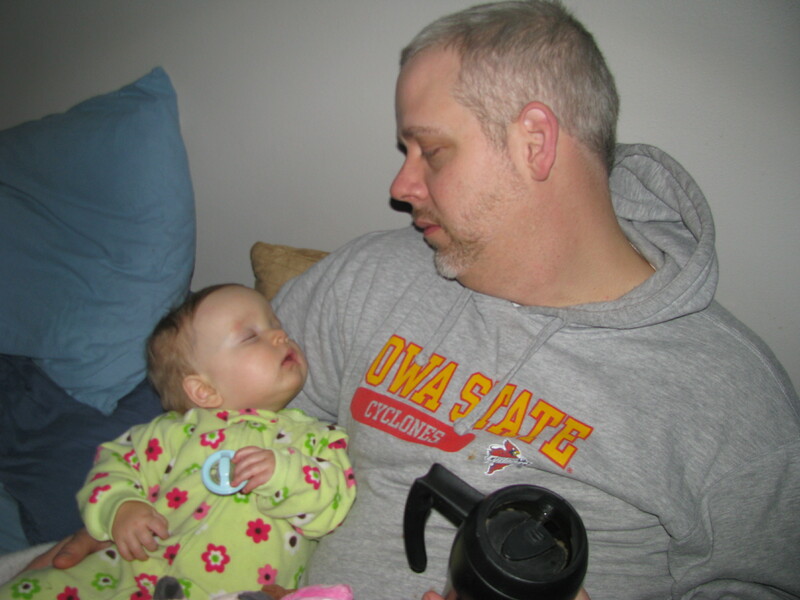 When she woke up again, she sat next to dad to cuddle and fell asleep again – sitting up. The whole morning went like that. No matter what we did, the poor kid couldn’t stay awake. She loves to stand on the couch and look out the window. But she just didn’t have the energy for it. She hadn’t eaten any solid foods since Friday morning and she was down to about 16 oz. of breastmilk a day instead of 22 oz. Monday at daycare she threw up all over the table at snacktime, so we headed back to the doctor that afternoon. Since she’d had a low fever for a few days, the doctor decided to get a urine sample (which meant a catheter for my poor baby!!) and a blood sample to test for infection and see how dehydrated she was. The tests didn’t indicate an infection, but the doctor did think she was dehydrated enough that she needed to be admitted to the hospital to get IV fluids. So we hurried up and waited over at the hospital for her IV. We got there at about 5:30. It was 6:30 before we’d gotten through the whole admission process and 7:30 before they attempted to put an IV in. There were 2 nurses on the Pediatric floor that night. They each tried, and failed, to get an IV in her foot. 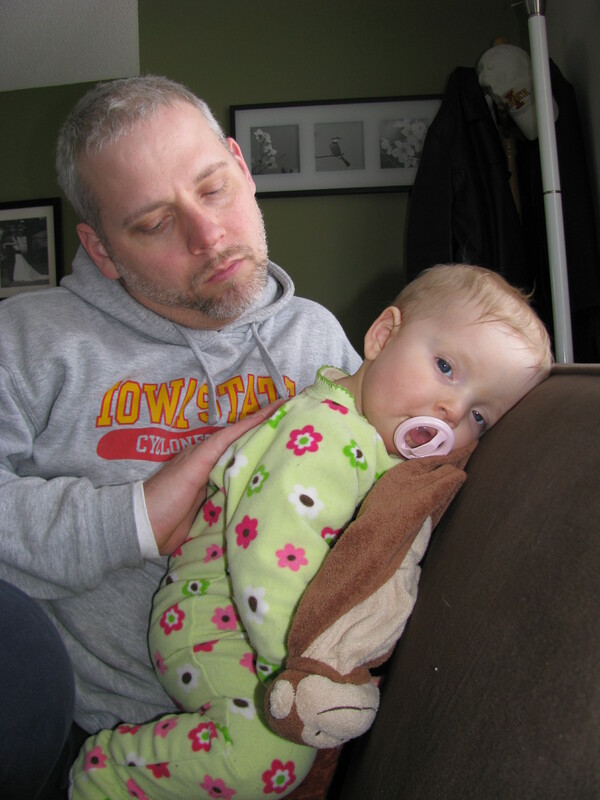 At 8:00 we were back in her room, she had gauze and Bugs Bunny band-aids on both feet and she was asleep in my arms. The nurses called the NICU and EMT’s to try to get someone up to help get her IV in, but they weren’t available right away, so we waited. At 9:15 the nurse came in and told us that an EMT was on his way up, but they were going to get another baby’s IV in first, but we should only have to wait another 15-20 minutes. We could tell she needed a diaper change, so after 15 minutes I woke her up and changed her, thinking we’d be headed in to get her IV soon and she’d be better off if she started out awake. So we waited and she was happy for about 15 minutes, but then wanted to go back to sleep – understandably so, because it was almost 2 hours past her bedtime!! When the nurse finally came to get us a few minutes after 10:30, Chloe Mae had been back to sleep for about 45 minutes and was not happy to be laid down on a table, with bright lights shining in her face while she was poked, prodded and finally stuck with a needle. 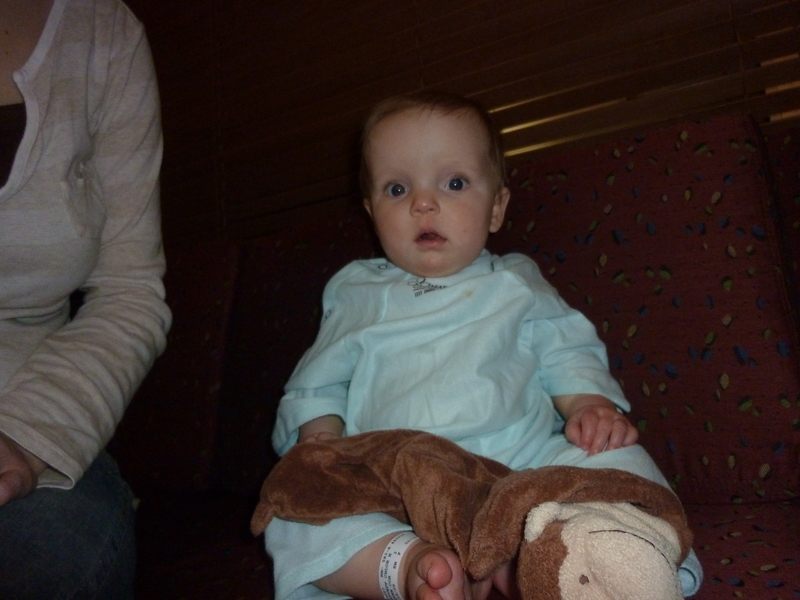 Finally, 5 hours after getting to the hospital, Chloe had an IV. She has yet to realize the trauma that is yet to come. 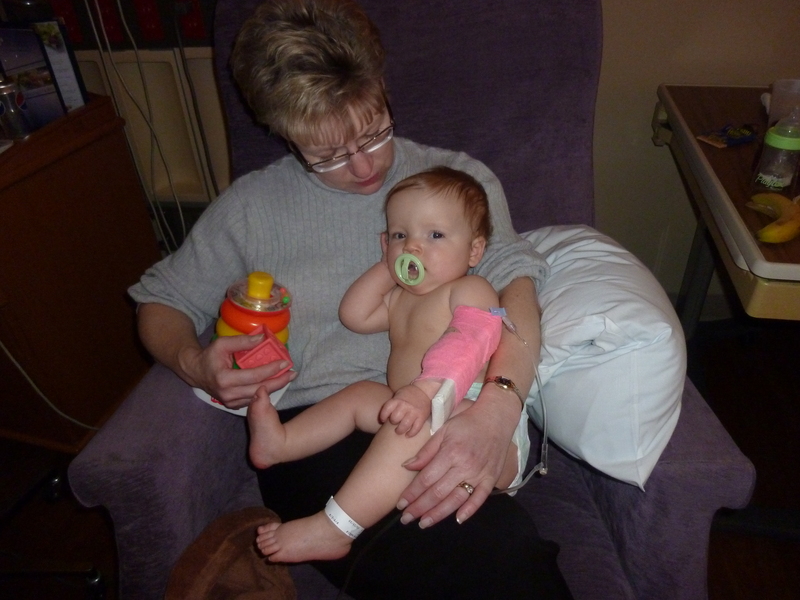 Immediately after getting her IV, Chloe was given a bolus of fluid, followed by maintenance fluids for a few hours. When she still hadn’t had a wet diaper after a few hours, she was given another bolus. She remained on maintenance fluids until about 9AM when the doctor turned down the levels to see if Chloe’s appetite would pick up. The doctor also ordered a chest x-ray at that time, because Chloe’s fever had gone up overnight and the doctor just wanted to further rule out infection. We finally got the results of that at about 2PM – it was clear – so they started the discharge process. Nanna came for some cuddle time in the morning. Trying to figure out how to play with only 1 bendable arm. She became a great 1-handed ring stacker!! By the end of her stay, Chloe was leary of anyone and anything. This poor student nurse had a heck of a time just trying to check Chloe's PulseOx. Chloe’s 9-month check-up was already scheduled for this Friday, so we’ll be headed back to the doctor then to see how she’s doing. Until then, we’re monitoring her every move to make sure nothing gets worse. If her fever gets too high, she starts eating less or sleeping more we have to call the doctor. Hopefully we won’t have to worry about any of that and she’ll be back to her cute, smiley, happy self soon!! 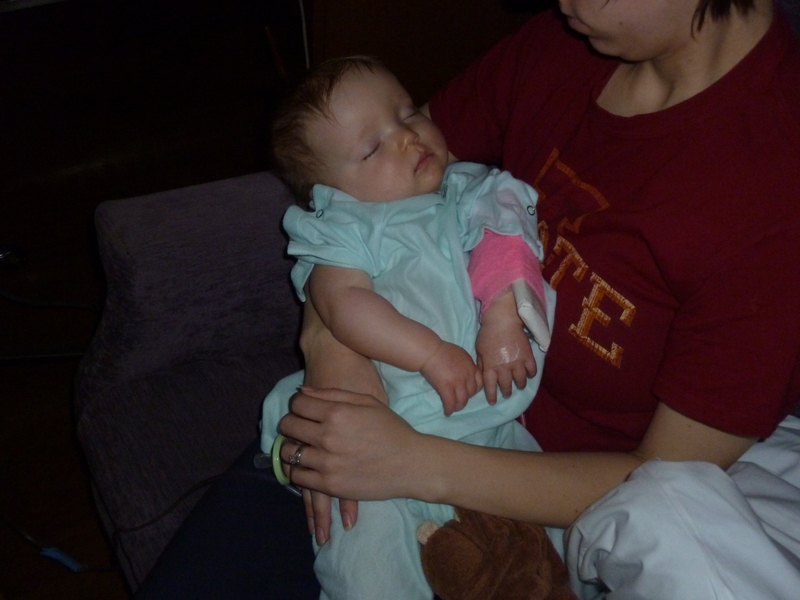 *It was very frustrating that we were there for 5 hours before Chloe got her IV, partially due to staffing issues, and then we got almost no sleep, because the nurse seemed to be making unnecessary trips into the room. We were told the nurses round every hour during the day and every 2 hours at night, but not an hour went by that the nurse wasn’t in for something and it seemed to me like she could have been a lot more efficient and combined a few of her overnight interruptions. However, that said, I certainly appreciate the hard work of the nurses who took care of us, but it was just a very frustrating experience in an already stressful situation. 30 Minutes or Less and It’s a Success!! What’s “it” you might ask?? “It” is any meal served to Chloe Mae. If she’s in and out of her highchar and eats a good chunk of food in less than 30 minutes I am one happy MamaMort!! Only a half hour to feed an 8 month old might not seem like much of a triumph to some, but Miss Punky Brewster has a bit of an idependent side to her (no idea where that came from!!) and does not want to eat anything we try to give her on a spoon. We came up with all kinds of theories on why she wouldn’t eat off a spoon for us. Then one night she was happily eating chunks of sweet potato, but refused the exact same sweet potato in the mashed up form on the spoon. At that point we just decided that it’s because she’s stubborn!! So we’ve adapted – isn’t that what being a parent is all about?!? 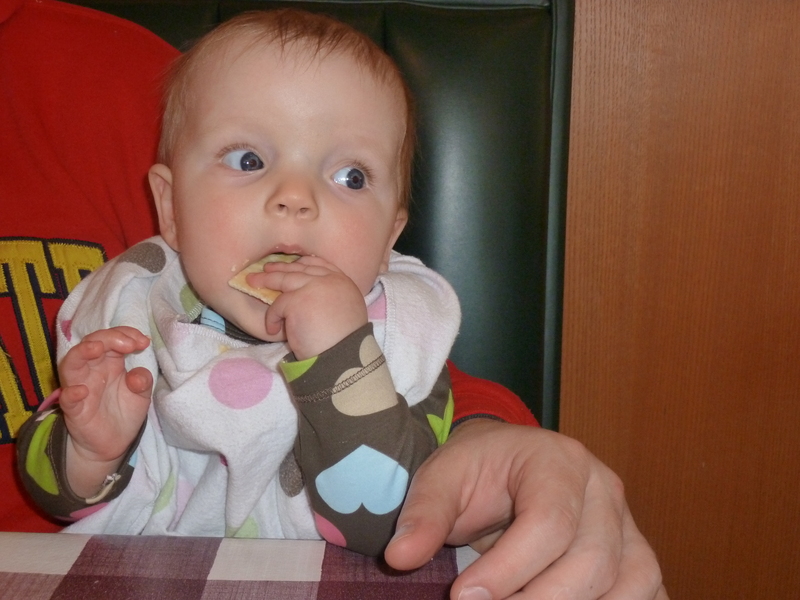 So now at dinnertime she gets finger food while we’re eating – chunks of sweet potatoes or carrots, peas, green beans – and some of what we’re eating when possible – beans from our soup or pieces of pasta and garlic bread. Then when we’re done, we sneak bites of baby food in when we can to help fill her up. Since she’s had ample time to feed herself without us trying to feed her, and making her mad, she’s usually a little more willing to eat off the spoon. And she’s fed herself enough that we don’t need to feed her quite as much baby food. For the moment, we’ve adapted and mealtime isn’t stressful. And next week, when she decides that practicing her pincer grasp and feeding herself is no longer the thing to do, hopefully we’ll be quicker to adapt! !